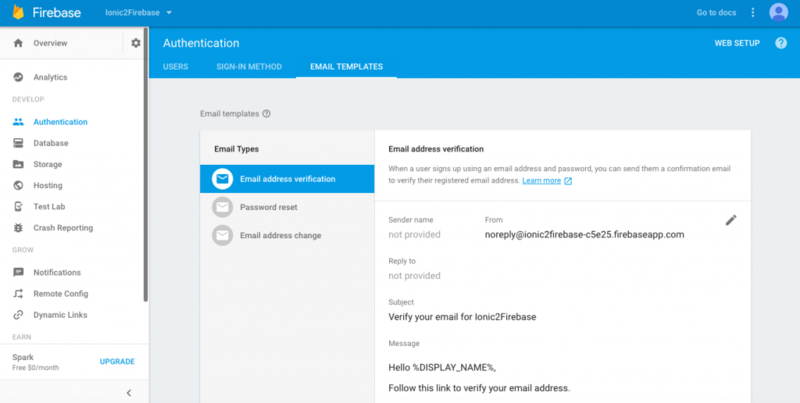 In this post I will describe how to use Firebase email/password functionality in an Ionic 3 application using AngularFire2. We will create a login form, a signup form and a password recovery form that will bind to your Firebase application. This post is a based on my previous post about the setup of Ionic 3, Angularfire2 and Firebase so I will go on from there. I’m not going to explain how this form works, but will focus on the login functionality using Firebase authentication. So change your home.html file to the code below. Now you should have a working login form, that will show an alert and logs the email and password to the console. So let’s create a provider by using the ionic generate command. Next we need to make the Module aware of this service, so we will have to change the app.module.ts file again. And try to login by entering a valid email and a password. Uncaught (in promise): Error: The given sign-in provider is disabled for this Firebase project. Enable it in the Firebase console, under the sign-in method tab of the Auth section. You can fix this by enabling the email/password provider in your Firebase project. So open up your Firebase console at https://console.firebase.google.com and select your Firebase project. 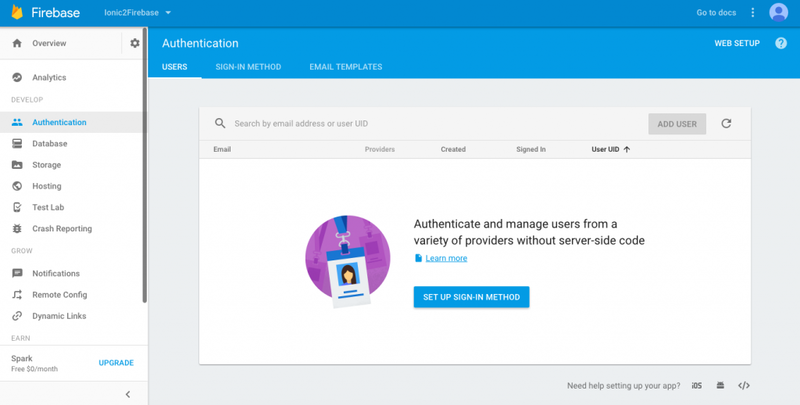 Select authentication on the left hand side and click the ‘set up sign-in method’ button. Next enable the Email/Password provider (We will enable Facebook and Google in a later stage). Uncaught (in promise): Error: There is no user record corresponding to this identifier. The user may have been deleted. As you can see, this isn’t a technical issue, but Firebase returns an error message, because the user isn’t available. We should actually handle this error in our code, so we can show the user a nice message like ‘This combination of email/password was not found.’ and ask them if they want to sign up for this app. The signup page has is almost similar to the home (login) page, but now it makes a call to the registerUser method on the authentication provider. We will create this in the next step. I’ve added some extra error handling, so it will show an alert when the user already exists or the password is not strong enough. There are much nicer ways to do this, but that’s up to you. So besides the register user method, there’s also a new method to logout and a method to get the current user (or actually it’s email address). If you want to add a displayname (or photo) to your user profile, you could uncomment line 35 and add it to the credentials object passed in to the registerUser object. Now we have a signup page, you should be able to use it :). First it has to be imported into the app module, so let’s update the app.module.ts file. Next we have to update the home page. We will create a new button to navigate to the signup page and we will also create a logout button and show the email address of the logged in user. So here’s the updated home.html file. And here’s the updated home.ts file. The last past of this post will create a password recovery page. Copy the following html in the generated ..\pages\reset-password\reset-password.html page. This is all similar to the signup page, only thing we have to do is create the resetPassword method on the authentication provider. Since there is no reset password functionality in AngularFire2 at this moment, we need a workaround. This can be done by creating a reference to the Firebase SDK itself. Next we need to import the reset password page in the app module and create a new button on the homepage to navigate to the reset password page. You should now be able to send and receive a reset password email from the Firebase application. 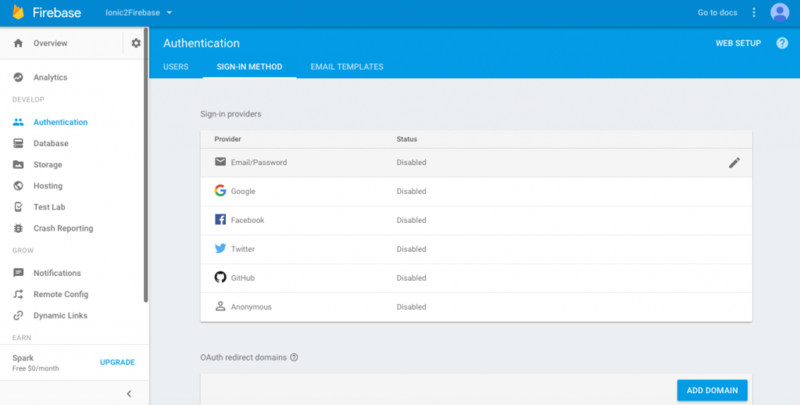 If you like to change the email template and properties, you can go to the Firebase console, select your application, select authentication on the left hand side and select the ‘Email Templates’ tab. I will try it later today, but looks perfect to me. Do you intend to continue this project with Firebase, using Database and Storage? I would like to make a list, and show the details of each item with Ionic, everything consumed from Firebase, to the images that will be in the list, and not the images of each detail of each item. Congratulations on the post, because you explain everything correct! That’s still my intention, but I’m very busy at the moment. on the homepage. Any ideas? BTW, this was towards the beginning of your tutorial, before we generate the Signup page. I see we have a submit function for other pages – should it also be on this page? I’ve removed (ngSubmit)=”submit()” should be working now.